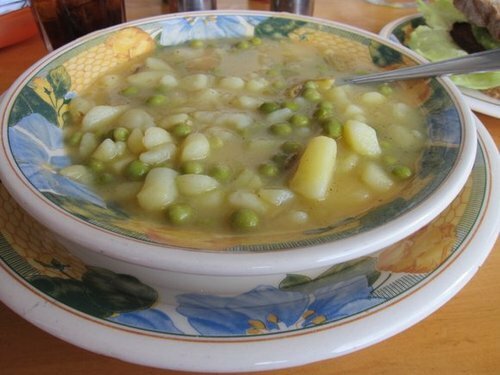 Finding vegan food in Vilcambamba, Ecuador was not the only easy thing about the place. Vilcambamba felt like a balm to the harried soul and stripped away the layers of stress and anxiety caused by fast paced modern living. By the time we were done with Vilcabamba on our South America backpacking route, my husband and I wanted to open a small, quirky Indian food cafe and B&B when I retire. Apparently the soil here is incredibly fertile and things just grow. 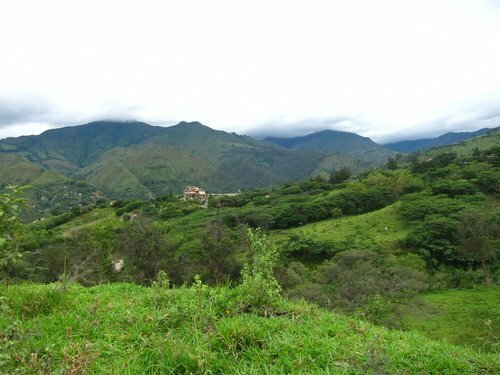 This spot is way south in Ecuador, close to the border with Peru. 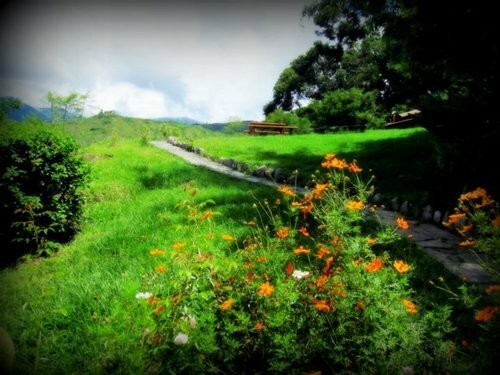 Vilcabamba is a very popular retirement haven with middle-aged and older expatriates from English speaking countries. You’ll find them gathered around expatriate cafes discussing everything about the world. One such awesome place is Charlitos. A very unpretentious cafe with a simple international menu (mostly American) and a very friendly owner. The owner Charlie knows all his regulars and takes time to chat with the newcomers too. 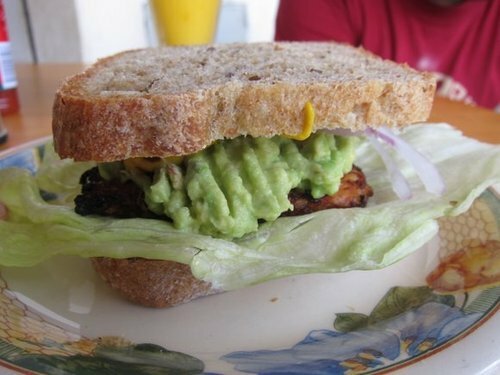 Anyway, he knew what vegan means and made a delicious tempeh sandwich. Turns out that the tofu and tempeh is locally made. I was so thrilled after not seeing tofu for weeks, forget tempeh, tofu’s more exotic cousin. Just uphill from the central plaza is Restaurant Katherine, another small hole in the wall cafe which is veg friendly. Restaurants are usually happy to put together something for me. In this case it was “arroz, verduras y lentejas” (rice, veggies and lentils). Finally, after a long long time, I got to eat soy products in Vilcambamba. 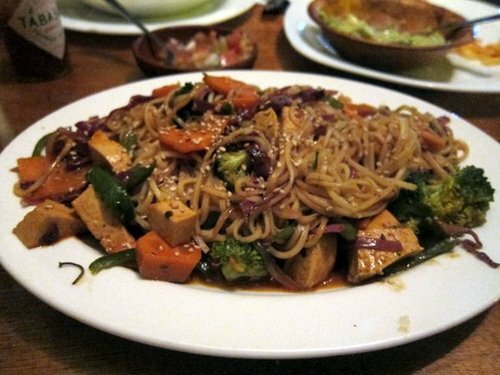 A tofu noodles dish from Resto. Terraza. Tofu wasn’t very easy to find in South America, so for a vegan this respite during our travels was a blessing! Restaurant Katherine; On calle sucre 12-54 & Fernando de la vega. Terraza Restaurant – at the corner across from the tourism office (oficina de turismo). Has tempeh and tofu dishes, rice and noodles. Hostal Izhcayluma just outside town has an extensive veg menu that’s very popular with all types of tourists. We stayed there and had a lovely time.